I realized last night that I hadn't tried out a rationing recipe for the week yet and quickly flipped through my books where I've marked all the recipes I'm interested in. I was craving something a little sweet after dinner, so finding the Maple Tapioca recipe got me excited! I found this recipe in my newly acquired book Grandma's Wartime Kitchen by Joanne Lamb Hayes. Her book is full of interesting historical bits and recipes. The Beet Relish is awesome which a friend of mine had made and let me try. To be perfectly honest, the biggest reason I wanted to try this recipe, besides it being a yummy tapioca, was because of the truly American touch of maple syrup instead of white sugar. The end result doesn't taste very mapley, but it does a great job of giving the right amount of sweetness without being overpowering. Not to mention it saves on rationed sugar. 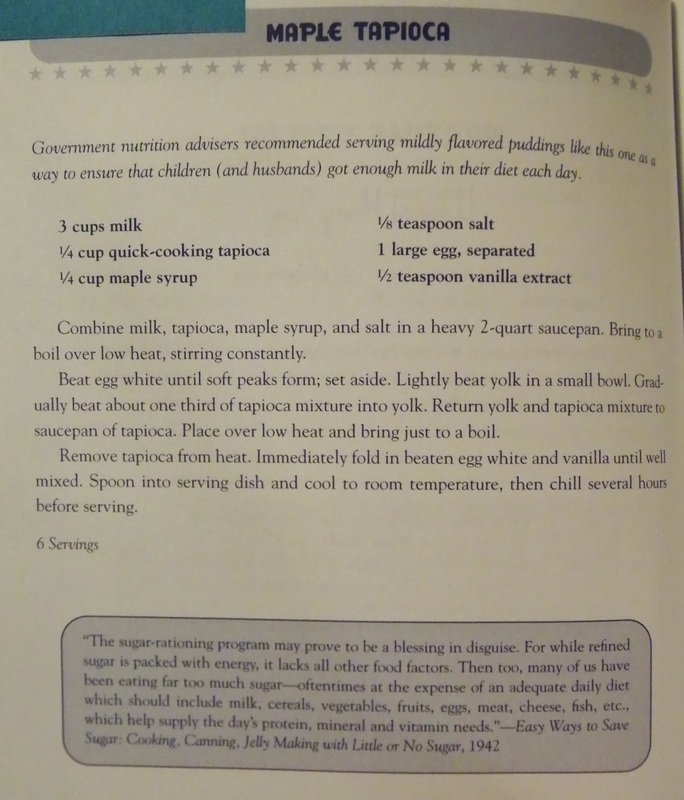 Another thing I liked about choosing this tapioca recipe is that Hayes mentions that "government nutrition advisers recommended serving mildly flavored puddings like this one as a way to ensure that children (and husbands) got enough milk in their diet each day." Unlike today, where there are various camps with different stances on milk, milk was considered a staple and valuable nutrition source. Nutrition was a huge focus of the government during WWII - in order to fight the enemy effectively and well, not only did the soldiers need to be in prime health, but the folks on the homefront needed to be as well. They had to work in the factories and be able to work the long hours at all of their war jobs in order to keep up the support for the war effort. Personally, I think this is a really interesting aspect of the war. I've got 30 minutes of stirring ahead of me! Moving on to the actual recipe - the fact that it called for quick-cooking tapioca was a little deceiving as you had to cook the milk to boiling on low and stir it constantly. So, maybe not the best recipe to try an hour before the kids' bedtime! Haha! I usually don't have much patience for custard, though I know the work and effort are far worth it. I absolutely adore a good English custard but tapioca comes second on my list, so I was really looking forward to the end result! Yay! Thickened milk with tapioca. Well, I was proud of myself for how patient I was stirring for half an hour (while jamming to some good music which helped). I didn't curdle or burn the milk at all! I was also happy with how it thickened up so nicely. After adding the egg yolk it looked like an amazingly proper tapioca custard. It was so creamy! But then the recipe threw me one for a loop. It said to fold in the egg white, whipped, left from the egg yolk. I suspect this may have been to avoid wasting the white because normally you don't put egg whites in a custard pudding. So, I added the whipped egg white with a very dubious look on my face. I shouldn't have been surprised what it did to my lovely (non-curdled!) tapioca custard, but I was. The egg white totally changed the texture of the tapioca from thick and creamy to fluffy and... sticky. As for taste it was absolutely perfect, even with the funky texture. It was just the right amount of sweet - a perfect accompaniment to any dessert or as a yummy snack. I'd recommend trying it, but if you want to skip the step of egg whites and just add the vanilla, go ahead. I think I'll try making it again and then enjoy the more dense and creamy texture sans egg whites! I like the little blurb at the bottom of the page. Just think how much sugar consumption has gone up since 1942! Update: August 13, 2015 - After more experience and reading more wartime recipes, it seems that adding the egg white was a common practice and a texture that was desired. It wasn't really just about saving the egg white, but giving it a fluffier texture on purpose.